Ren wrote a great post on his blog the other day on what makes an epidemiologist. He didn’t mention The Kid (a.k.a. Jake Crosby) by name, but I’m pretty sure that’s who Ren was talking about. It seems that Jake Crosby, on account of having earned a Master of Public Health degree from the George Washington University, fancies himself an epidemiologist. I agree with Ren that people like Jake Crosby are not and never will be epidemiologists. Jake Crosby is not an epidemiologist because he does not work as one — to the best of my knowledge — and, most importantly, he is not an epidemiologist because he believes that vaccines should be eliminated altogether. Anyone with an ounce of decency and common sense in their bodies would not call for the end of something that has saved countless lives. The book in question is a new book by RFK Jr. about vaccines and neurodevelopmental disorders. As you can see, Jake Crosby and his reader appear to have developed a macropapular rash when the book is quoted as lauding vaccines for the “achievement in medical science” that they are. “That ingredient” is thimerosal, a compound that contains mercury but is touted as being nothing but mercury by people like Jake Crosby and others. Jake Crosby is apparently angry because one of his (apparently former) idols, Robert Kennedy Jr., is promoting a book about thimerosal causing, among other things, autism but doesn’t go as far as to call for the end of vaccines. There was a time, way back when, when I would have given Jake Crosby the benefit of the doubt and chalked his anti-vaccine screeds to him just being fed anti-vaccine lies by his friends at Age of Autism. Today, Jake Crosby is an adult who has attended a four-year college and a two-year master’s degree, has been given all the tools of epidemiology to use, has been given all the evidence when it comes to vaccines, and he still calls for the elimination of the vaccine program. How he can classify himself as an epidemiologist after writing those things is beyond me, and beyond reason. I think Ren went lightly on Jake Crosby’s antics. Me? Not so much. Jake Crosby will never be an epidemiologist because epidemiologists read the evidence and come to the reasonable and proper conclusions. They don’t see monsters under the bed or chase windmills. They don’t call for the elimination of the vaccine program and thus, in essence, call for the return of diseases that would kill thousands upon thousands of children worldwide every day. It’s par for the course for anti-vaccine types, however. 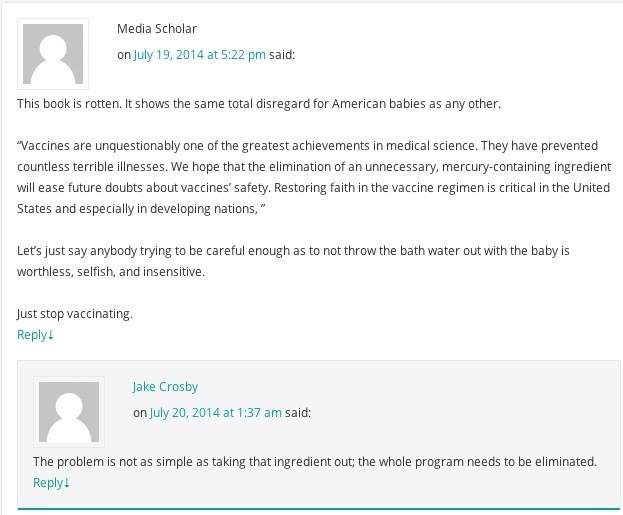 This entry was posted in Blog and tagged #antivaccine, #epidemiology, #jakecrosby, #lies, #Vaccines. Bookmark the permalink. You’ll notice I didn’t go easy on the epidemiologist wannabe, Reuben. He posted a comment on Keith Kloor’s Washington Post blog about Kennedy’s book. I asked him about the topic and the name of his mentor for his culminating experience for his GWU MPH-Epidemiology degree. Odd. He never replied. When his mommy told him he was toxic from vaccines…she lied. Perhaps, it is that Jake honestly desires to be an epidemiologist during a pandemic. Hence, he wishes vaccines to disappear so that he’d get his wish on an incessant basis. A new syndrome, Münchausen by lunacy.